ARLINGTON, Va. - He didn't introduce himself. He didn't have to. 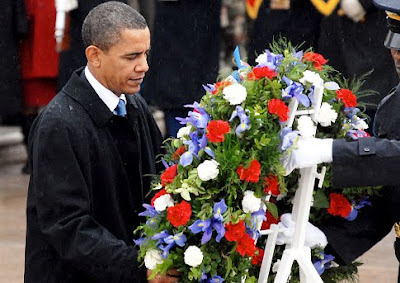 President Obama simply stuck out his hand and asked for my name as he stepped toward me amid a bone-chilling drizzle in the Gardens of Stone. This was Section 60 of Arlington National Cemetery. I wasn't there as a reporter, but to visit some friends and family buried there when Obama made an unscheduled stop - a rare presidential walk among what Lincoln called America's "honored dead" - after laying a Veterans Day wreath at the Tomb of the Unknowns. What I got was an unexpected look into the eyes of a man who intertwined his roles as commander in chief and consoler in chief on a solemn day filled with remembrance and respect for sacrifices made - and sacrifices yet to be made. I'm sure the cynics will assume this was just another Obama photoop. If they'd been standing in my boots looking him in the eye, they would have surely choked on their bile. I had stopped at Arlington to see the resting place of Ken Taylor, Ed Lenard and Dave Sharrett. Ken and Ed survived their service, in World War II and Korea, and died as old men. Dave did not leave Iraq alive. He was 27. Obama arrived just before noon at the serene Section 60, where many of the dead from Iraq and Afghanistan are buried together - and where many more heroes will undoubtedly be laid to rest before this President leaves office. It's a section typically bustling with those visiting loved ones. Every time I go there, more and more graves have been dug into the earth. The President and First Lady Michelle Obama emerged from their armored limousine hatless in the frigid downpour and took a slow stroll into the soggy rows of white marble headstones. They stopped first at the grave of Medal of Honor recipient Ross McGinnis, an Army private who threw himself on a grenade in Iraq three years ago to save four buddies. A sad-faced woman reached for Obama's hand and pointed him to a nearby plot. The face of another woman - who had grimly sat in a folding chair for hours next to a headstone she'd arranged flowers around - suddenly broadened into a smile as she stood to embrace Obama and thank him for paying his respects. And then Obama noticed a tall, bearded figure. He probably didn't see the mud-caked combat boots I trudged around Afghanistan in a few years ago. "What's your name?" a somber President asked as he extended his hand. "James Meek, sir," I replied, struggling to pull off my wool glove and pull my hood back from my head. "I'm here visiting a friend, Pfc. David H. Sharrett II, who was killed in Iraq last year." He asked how I knew Dave. I explained that his father, also named David, was my high school English teacher in nearby McLean, Va. My classmates and I knew Dave as a little boy playing at our feet. "He became a star football player and was one of the toughest soldiers in the 101st Airborne Division," I told Obama. I didn't tell the commander in chief that Dave was killed by friendly fire. Or that the Army bungled notifying Dave's parents of a probe that concluded his lieutenant tragically mistook him for a terrorist in the dark and shot him. Or that his family had to fight for accountability - which two battlefield commanders promised but stateside generals derailed. That wouldn't have been appropriate, Dave's deeply grateful father later agreed. Ironically, I was ready to leave the cemetery an hour earlier, but it went into lockdown because of Obama's visit. "Sorry for any inconvenience," a terribly polite Secret Service agent whispered in my ear. 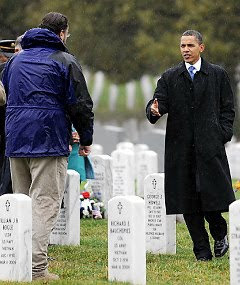 As the Obamas ended their pilgrimage through Arlington's hallowed ground, inconvenience was hardly what I felt standing there as the rain pelted my coat, staring at blades of grass around a headstone etched with a name and a date I will never forget.